While traveling on a different country Passport is your identity. So, you have to keep it safe from any wear and tear as well as prevent theft. There are lots of ways to protect your passport but the best way is to choose the best passport wallet and keep it safe there. There are lots of passport wallets that are available on the market. I have taken the courtesy to pick the best passport wallet/holder and then enlisted here. So let’s have a look at them. Bellroy Travel Wallet can also be called travel document holder and I consider it the best passport wallet. It can accommodate various things like your passport, tickets, cash cards and other important documents along with a tiny pen. There are designated sections for passport, tickets, bills and 4 to 10 cards. It is made from top-grain leather which is certified. Dimensions of the wallet are 3.8-inch x 6-inch. 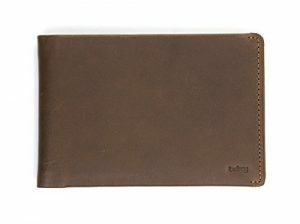 In the looks, the wallet is beautiful and well crafted. It will give you a premium feel even if you are just carrying it. What else you need? The wallet is covered under a 3-year warranty so you don’t have to worry about any quality issues with the product. Zero Grid Passport Wallet can come in quite handy if you have passport and cards that have an RFID chip. The wallet has RFID blocking mechanism which means that any RFID enabled thing in your wallet can’t be read by the RFID reader. This ensures that no one can get unauthorized access to your details as long as you remove them from the wallet. The wallet is made up of Water-resistant ripstop nylon with zipper closure. 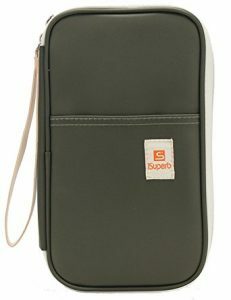 It is very compact and can easily be slip into a small personal bag or a purse. You can carry your passport, 4-10 cards, and other important documents easily in this wallet. Zero Grid Passport Wallet comes with 100% Lifetime Money-Back Guarantee. 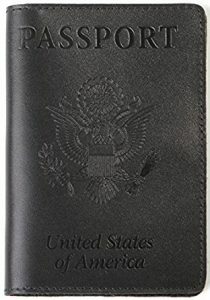 If you are worried about carrying a wallet in your pocket and having it stolen then this is the best passport pouch for you. 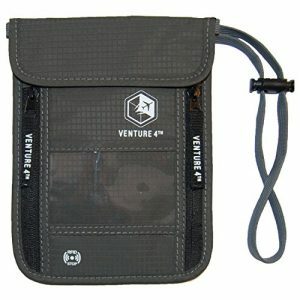 Venture 4th Travel Neck Pouch is made up of 100% durable ripstop water-resistant nylon material. Similar to the previous wallet it has RFID blocking mechanism. This will ensure that your private information stays private and out of anyone’s reach. It is 5.5 inches high and 8 inches wide and is suitable for both men and women. You can use this large size to store anything from passport to any paperwork. 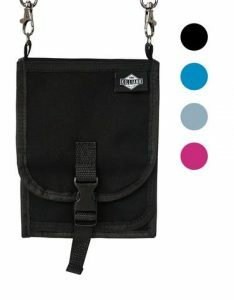 There are three compartments inside the pouch two zipper pockets and once velcro storage. This pouch comes with 100% satisfaction guarantee and is also backed by Lifetime Warranty. So basically if you buy this pouch Venture 4th got you covered! When you are talking about travel accessories, as I recall Amazon is never behind. So here is the AmazonBasics RFID Travel Organizer which is made of 100% nylon. RFID blocking material is used to prevent any unwanted scans of RFID scans of your passport or cards. It is 10 inches tall and 5 inches wide which mean it is big enough to carry lots of cards, passport, and documents. It has dedicated slots for cards. Also, there are lots of pockets and zippers which will help you organize everything in a perfect manner. On the external side, one pocket is available to store quick access items. In brief, it is the complete package. Let me know what you think about AmazonBasics products. iSuperb Passport Wallet Organizer is a choice for travelers who desire a lightweight wallet but require a large space to store passport, cards and other documents. It is crafted from durable waterproof polyester. This makes it very lightweight. Similar to AmazonBasics organizer it has lots of pockets inside so you can organize and keep your cards and passport. To be exact 7 card slots, a small pocket, a large pocket, a pen slot, a mesh pocket and a big pocket for Passport. On the outside, you will get one zippered pocket and on the other side, you will get a normal pocket. There are five color variants available but all of them will have a white zipper. Unlike all the other wallets and cover, Shvigel Leather Passport Cover is a leather case where you can simply put your passport for protection from external surroundings. The material is 100% leather as claimed by the company. The dimensions of the cover are roughly same as that of a passport: 5.2-inch x 3.7-inch. It comes with 100% money back guarantee and additional 1-year guarantee. You can say that this is the minimalistic protection for your passport from any wear and tear or rough usage. Also, it only weighs around 0.3 ounces. 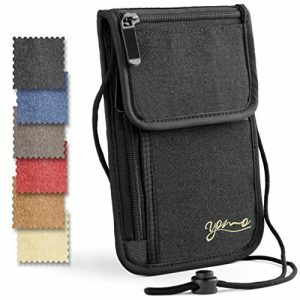 YOMO Passport Holder is for those travelers who don’t like wallets or cases. This can simply be worn in the neck. Actually, it is quite similar to Venture 4th Travel Pouch. It is RFID safe so you don’t ever need to worry about unwanted scans of your RFID-enabled cards or passport. There are five pockets inside the case so you can put up cards, receipts, documents easily in them. Its classic design makes it suitable for men and women of every age. The string is skin soft so you will never experience any itching after wearing it even for long times. YOMO provides 100% satisfaction and a lifetime warranty on this Passport Holder. 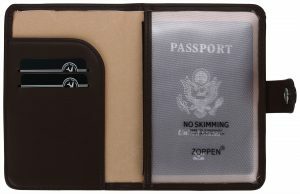 Zoppen Passport Holder is an amazing choice for the travelers who also need to carry few cards with them along with the passport. The passport holder is crafted from polyurethane and faux buck leather. It is eco-friendly and according to US and EU standards. The snap button closure is there to keep things tight and prevent anything falling out. 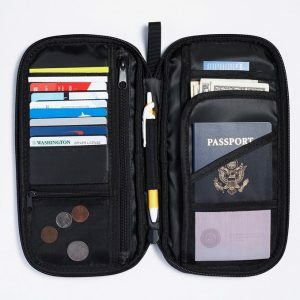 It contains one passport pocket, two card slots and one wing pocket for storing tickets, boarding pass, and other receipts. 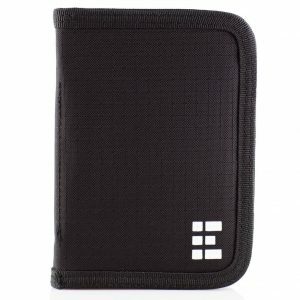 The built-in RFID shield will protect you from any E-thefts which is a great security measure nowadays. The Passport holder looks elegant and is very lightweight with dimensions: 5.9″ x 3.9″. It weighs around 0.13lbs. If you are a color freak then you will be happy to know that it comes in 4 different color options: Royal Blue, Dark Olives, Emerald Green and Scarlet Red. Killiano Document Organizer provides an awesome way to protect the critical documents using a flap closure from pickpocketing. By wearing it around your neck you can ensure that the documents stay where they are supposed to be. In addition, it also has RFID blocking mechanism to prevent any unwanted and random RFID scans by thieves who can misuse the information. There are several multipurpose pockets like a Velcro pocket for smartphone, zipper pocket for keeping money safe and a zipper pocket for keys and other stuff. The document organizer is covered by 100% satisfaction guarantee so you can return it if you are not satisfied with the product. As I told you earlier, while traveling abroad passport is your identity and hence should always be with you safely. These were the 9 best passport wallets, holders, travel organizers that you can use while traveling to keep your passport as well as other documents safe. If you are using anything else then do let me know. I will be glad to review it and add it to our list so that the other readers can benefit from it. Also, if you buy any of these products then don’t forget to share your experience with me and other readers using the comment section below.